It’s National Zucchini Bread Day so I thought I’d share this recipe with you that was given to me by my grandma when I was a teen exploring my passion for baking. I have treasured this recipe ever since and when I’m craving a sweet breakfast or a snacking bread I always turn to this easy and delicious recipe and think of my grandma. 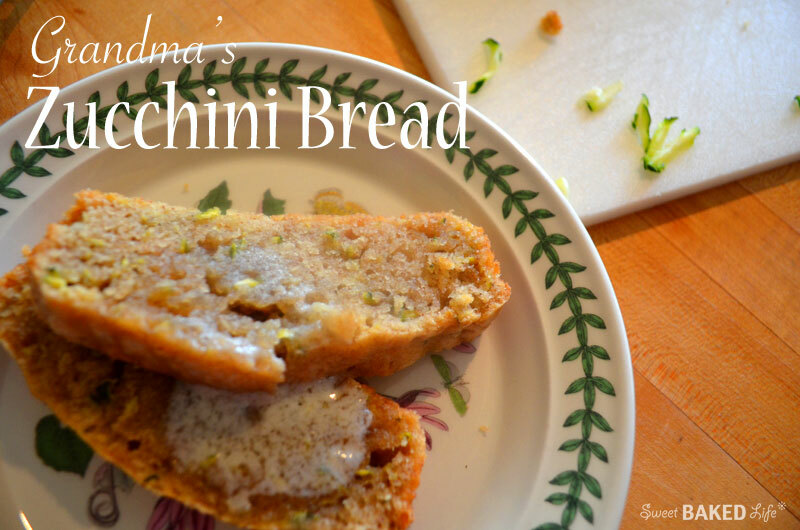 Now let me tell you, my “boys” are not big fans of zucchini bread; as a matter of fact my son will not go near anything green! However, they do enjoy this bread dotted with green specks, if only many to make me happy. Prepare 2 medium sized loaf pans with cooking spray and line with wax paper. Set aside. In a large bowl, beat the eggs well. Add the butter, zucchini and vanilla and mix. Add all the dry ingredients and mix until just combined. Note the mixture will be thick. Divide the mixture evenly into each of the prepared pans. Bake for 50-60 minutes. Let cool on rack for about 30 minutes then remove from pans to continue cooling on rack. Serve warm or room temperature. I love this bread, especially served warm, and if you dare, top it with some creamy sweet butter and enjoy with a nice strong cappuccino. For me, this is great for a weekend breakfast or mid-day snack. Thanks for the recipe grandma; hopefully you are smiling down on me today!